Back to a “real” post now after all the book stuff, but it’s going to be a short one while I get back on my feet. These worksheets all come to you separately, but really you just want them as one big table. Naturally, if it’s a small number of sheets, and each sheet isn’t massive, you can just copy paste them all into one table in Excel, then copy/paste into PowerPivot, or link the table into PowerPivot, or export as CSV so you can import it. And you could also use Paste Append to directly paste into PowerPivot. But if the combined data set exceeds 1 million rows, you won’t be able to combine the sheets into one – you will exceed the worksheet row limit. And a data set of that size is not something you can paste into PowerPivot directly with Paste Append – pasting large data sets into PowerPivot takes forever, if it completes at all. 2) Save each sheet as CSV. When you save as CSV, it saves only the active sheet, so you have to repeat this for each sheet (or each workbook). This part is really the only “trick” in the whole process. Great info, Rob! Do you also know how to break a csv file into a gruop of smaller files (without opening it)? 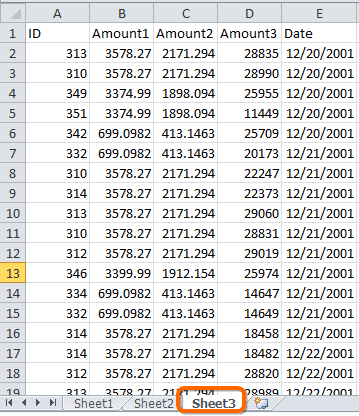 It is very odd that this action (combining datasets) isn´t a native part of PowerPivot. Consolidation of data must be one of the most common work-tasks for the average Exceljockey. I know that Kasper de Jong posted another way around this problem a while back using Excel´s data connection as the method. Nice VBA. I’ve been using that DOS command to combine my UPS Billing files for each week into one large csv for PowerPivot. Would be nice if PowerPivot could do an incremental update each week instead of importing all of the data even though the only data changed is in the newest file. For splitting large files, you can try this macro. Otherwise try searching for text file splitter. When confronted with three large spreadsheets, I’ve found creating linked tables to accomplish the first step of the goal. Then defining links between them provides a means of joining the tables. Or do i not underatand what you were trying to create? plus you don’t have to ‘save as’ with each file and use a cmd window. the example works fine but with my sheets I did not succeed. Although the sheets have identical headers however different number of rows connection was not possible. Is there a limit to the number of columns? This is pretty great. However, the remove header and/or saving each csv filter is still a manual process for each sheet. Group all sheets and deleting the row work might work for the remove header. Any way to quickly save all sheets into separate csv files without a macro? Is there any way of doing this for Non-excel databases? I use Dynamics NAV & want to merge the Sales Line, Sales Invoice Line & Sales Cr.Memo line tables before creating a report from the combined table. I had a similar needs to analyze employee activities of different types in one combined PowerPivot table. Did you manage, Paddy, to find a solution? If so, could you give some ideas here or just a link to solution? Rob, this is superb. It is very nice and simple way of doing it. I exercised it with .csv files 2; 3 and up to 4 GB. Now, I hit 4,2 GB and it is not working. I have 16 GB RAM, so I can assume that local memory is not an issue… Any ideas why if .csv > 4GB it is impossible to import CSV into PowerPivot? Thank you. When does it fail? On import into PowerPivot, or on creation of the combined CSV? Also, are you running 32 or 64-bit Excel? If 32 bit, Excel can only use something like 2 GB of RAM, no matter how much RAM is on your computer. I prefer 64-bit Excel purely because of PowerPivot. But if your office version is 32-bit it is apparently not possible to install the 64-bit add-in? Our IT department recently installed the powerpivot add-in however it does not work correctly, e.g. i cannot get data from different sources into powerpivot, only by copy and paste. How do I find out if they installed the correct 32-bit add-in or is there a way to test it? Hi, thank you for your reply. it fails when I tried to import CSV into PowerPivot. This particular CSV can hold 4,02 GB (app 16,5M lines X 36 columns)- no problem. I have 64-bit excel. 36 columns is a lot. Do you need all of those? Can you import just a subset of them? PowerPivot has no problem with massive row counts but columns are a killer with large data sets. 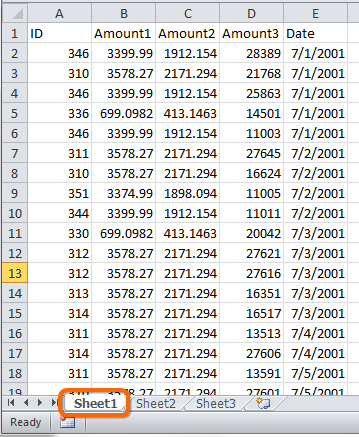 Also, if you have calculated columns added to that table (in PowerPivot), try deleting them, then importing the data, then adding the columns back. That sometimes works. 1- Decrease number of columns from 35 to 28. Result- same file is not 4,2 GB it is now 3,37 GB. 2- Load .csv as text to PowerPivot- no problem. Now even faster. Result: that particular problem- solved. I think it is obvious that it is impossible (in my case) to load .csv>4,00 GB into PowerPivot. Why did I start using .csv solution? Option2- use Rob’s example. Can combine more compressed .csv files (15M lines X 36 columns or app 20-22M lines X 28 columns. Conclusion: (in my case) no matter how I doing it in 64-bit excel I am hitting the wall after 4 GB data source. Question: how to load more lines with 28 columns within max 4GB data file? So fare .csv is the best, but kind of not good enough for my requirements. Alex, now we are 2 years later. Did you, and how, manage to pass the 4 GB barrier? There is à problème with importing data from CSV file when a text column contains both numeric & text values : if there are more numeric values then text value are loss and vice et versa. does somebody had solve this problème ? How do you edit the CSV if it’s great than 1M rows and you want to delete the header before combining it? Also, is there a way to import the data into an existing powerpivot model? For ex. I have monthly data that I need to refresh every month in an existing powerpivot model but I’m not sure how to update it without creating a new table and remapping all the formulas. I use a text editor (EverEdit (free version)) which can load a .CSV file FAST! Remove the top line, re-save, and you’re good to go! Thanks! Do you know what the max # of rows EverEdit can adjust? I tried Notepad++ and it capped out. You might want to try the latest PowerQuery Add-in for Excel (from Microsoft, and now part of their Power BI offering.) Do a web search for the download location. Iam new to PowerPivot is the only way to combine the .CSV file or is there is any another way. Take a look at this video clip on YouTube… Appending Files via PowerQuery. A way to do this without writing VBA is http://www.combinespreadsheets.com/. I’m working on it as a project and I’d love to hear your feedback. I would think that you might be able to do this using PowerQuery (or the new PowerBI Preview Designer program (if the file resides on your local hard drive) and just make copies of a working query. You might have to give a slightly different name, TestDataImport01, TestDataImport02, etc. I have two data models of 200,000 rows each with the same headers I separated them with Power Query so I could connect to them and start performing calculations. Problem now is they appear separate without some sort of relationship between them. How do I connect them to get simple tasks like SUM of both columns with the same name? This stuff is so easy to do using Power Query that it’ll make you giddy! I can recommend Ken Puls’, “M is for Data Monkey): A Guide to the M Language in Excel Power Query” book. $9.99 for the Kindle version e-book for some incredible time-saving tips. next post: Conditional Formatting Controlled via Slicers!